if you live in the Marina look out! The ribbon is the perfect touch.. simple but not trying too hard! Animal print is perfect for a bachelorette party! love it! PS if you do tie-die cupcakes, please post pictures!! :) Sounds cute. love your header! fabulous photo, love it!!! i am so thrilled to have discovered your blog! i love your passion for paper, parties, and all that goodness! i saw you were kind enough to become a follower of my blog (http://www.katelandersevents.blogspot.com), and i just wanted to thank you for doing so, and hop over to introduce myself! i would love to chat parties with you anytime! you can always e-mail me at info@katelandersevents.com, or leave me a comment as well--party theme you would like to see me do, questions, tips, suggestions, ideas...i worked in the high-end stationery industry for over three years and my passion for paper is going to stay with me for life! 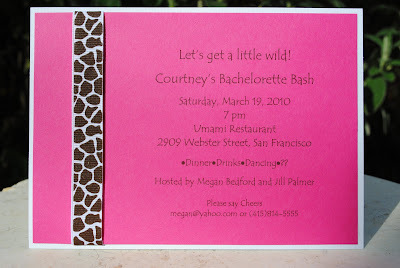 LOVE invitations and all things personalized! if you haven't already, i would invite you to enter my little birthday giveaway! and of course, please feel free to share it with friends, post it--anyone you think would enjoy it, i want to give the opportunity as many people who would love to win it! thank you again for following, and i am so glad i came to your blog! it is fabulous! thank you kindly, and hope to chat soon!